My new apartment is laid out in a longitudinal way with the master bedroom on an opposite end of the living room/balcony. This makes the terrible internet situation in Lebanon even more challenging because finding a router system that reaches both ends is tricky. 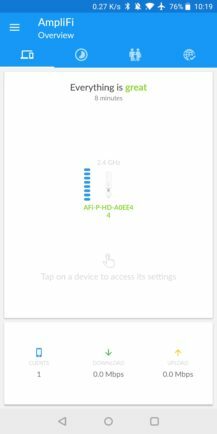 After a lot of research, I opted for a TP-Link Archer VR2600 that we had to place toward the living room side of the house. On paper, it seemed to fit the bill with speed, dual-band, guest network, parental controls, and a neat Android app. Most importantly, it had an RJ11 port, which is how our ADSL internet is delivered. For a while I thought about upending the whole experiment and switching to a mesh system, but I'd need to keep the VR2600 as a modem and then use one of the mesh points as a router (none of the current mesh systems I've seen have a built-in modem or RJ11 port), plus place an additional mesh point to cover the entire house. More electrical outlets being used, more points of failure, and a complete new network setup. I was not ready. I looked into repeaters, but it seemed that most (all?) 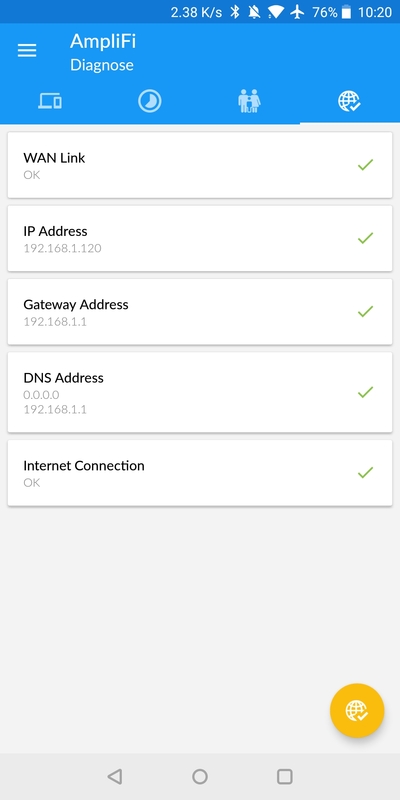 would create an additional network, which goes against having one network for all the gadgets and smart home devices. I was stuck. 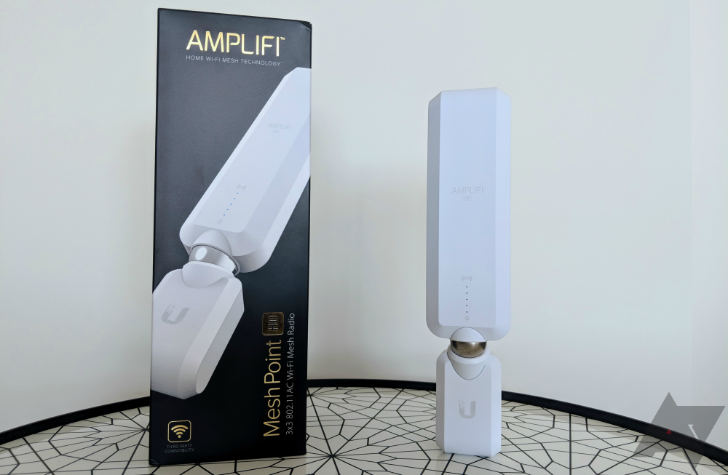 That's when I came across Ubiquiti's AmpliFi Mesh Point HD. At first glance, I thought it was solely a mesh point for their existing AmpliFi HD router, but turns out it works with existing routers too. After an Hallelujah moment where I nearly heard birds sing, I decided to give it a go. If it did what it promised, it would solve all of my issues without creating any new ones. And so far, I can say it has filled those big shoes. Setup Getting the AmpliFi HD Mesh Point up and running took less than five minutes. Seamless integration It uses the same network as my router (SSID and password) so I didn't have to change anything with my devices. 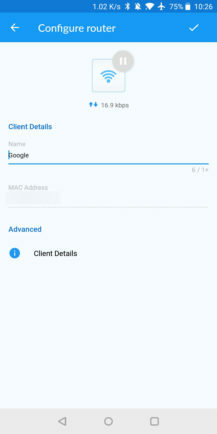 Android app It's relatively well designed and lets me easily monitor usage and connected devices. Dual band support The mesh point can both input and output on the 2.4GHz and 5GHz bands. App, again There's one annoying bug after setup or updates where it fails to connect to the mesh point. Rare issues If you place the mesh point too close to the original router, your devices may have trouble knowing which one to connect to. 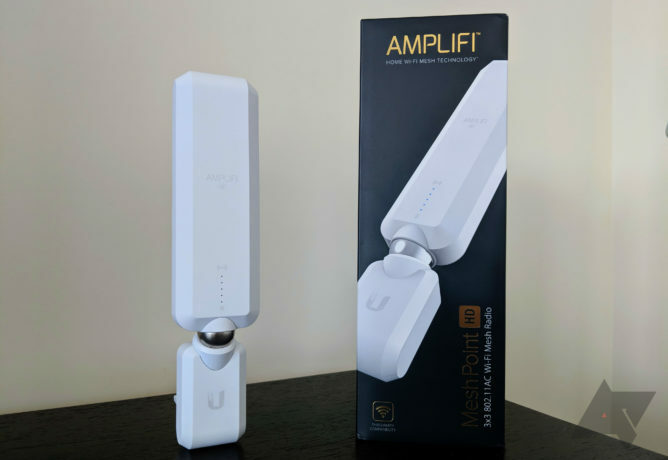 The AmpliFi Mesh Point HD (from now on AMPHD) is super simple in terms of hardware. 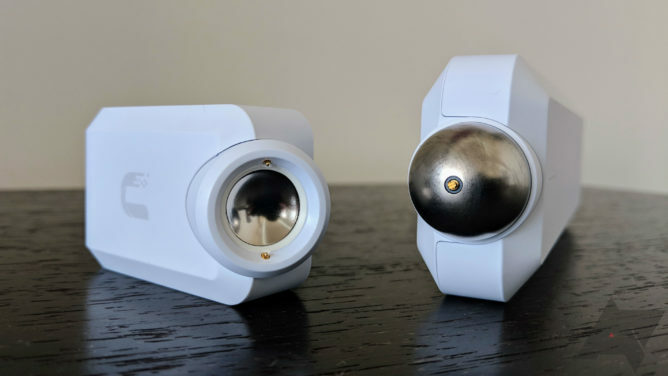 It's white to better blend with walls, well built and hefty, and it has a ball joint in the middle with magnets and pins so you can snap it into two pieces or rotate it however you want. 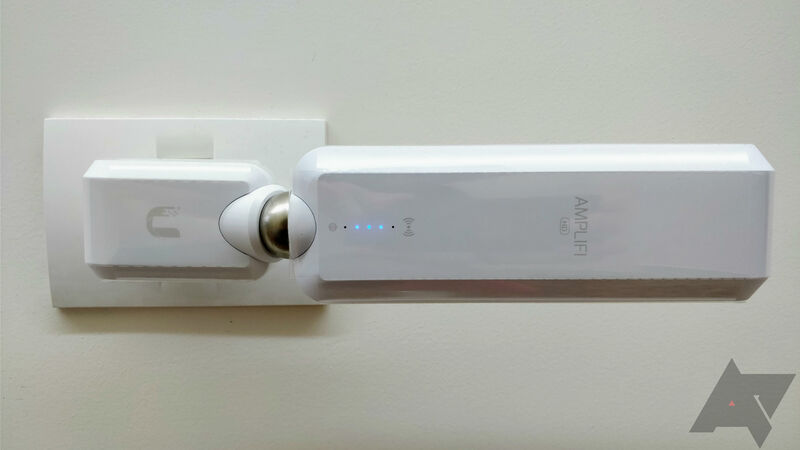 The small part plugs into the wall outlet (there are versions for the US, UK, EU) and the large part acts as the rotating antenna. There's no power button, only a small reset pin on the small side, and 5 blue LED lights on the antenna part. 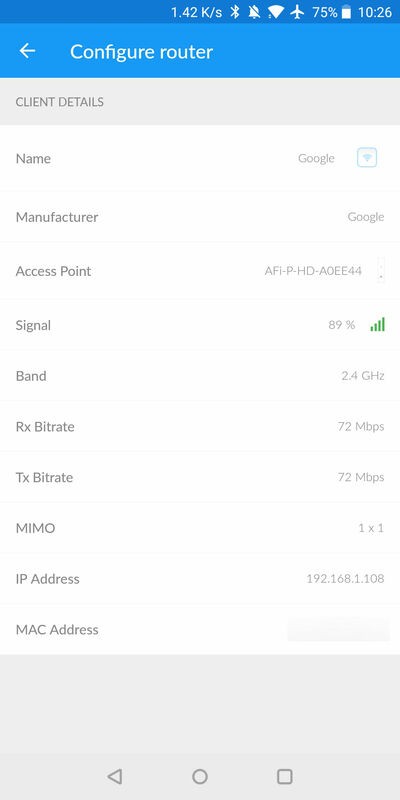 These change their pattern depending on which state the AMPHD is in (setup, looking for a network, updating) and when connected they indicate the strength of the signal. Ideally, you want to plug the AMPHD so that the antenna is going upward, but since the EU wall plug in the hallway where I found it best suitable to install is angled wrong, my unit is going sideways. So far, I haven't had any issues with it weighing down or falling or being tripped over inadvertently. 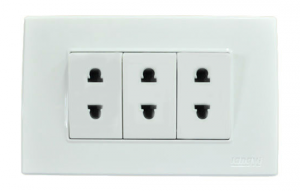 But I am planning on getting my electrician to replace my A and C combination outlet (like this) with a proper C outlet so that the AMPHD is plugged vertically. Once plugged into power, the Mesh Point turns on and gets itself ready for set up. 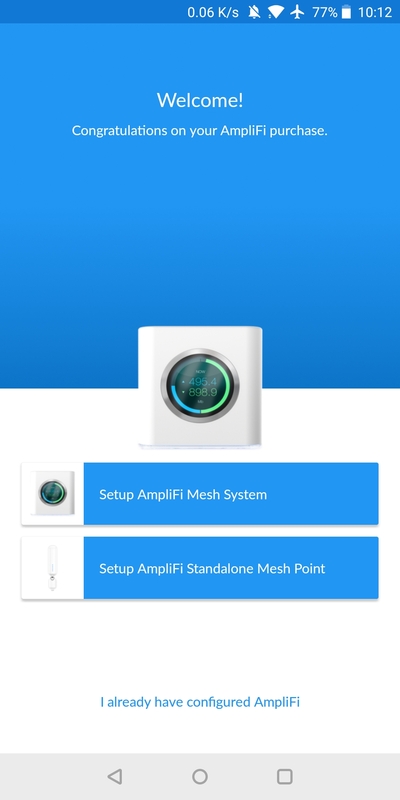 The AmpliFi app guides you through the steps, which are pretty straightforward: add a mesh point, turn on Bluetooth because that's how the phone sees it the first time, connect to the mesh point, teach it your WiFi network and password, and wait a minute or two. 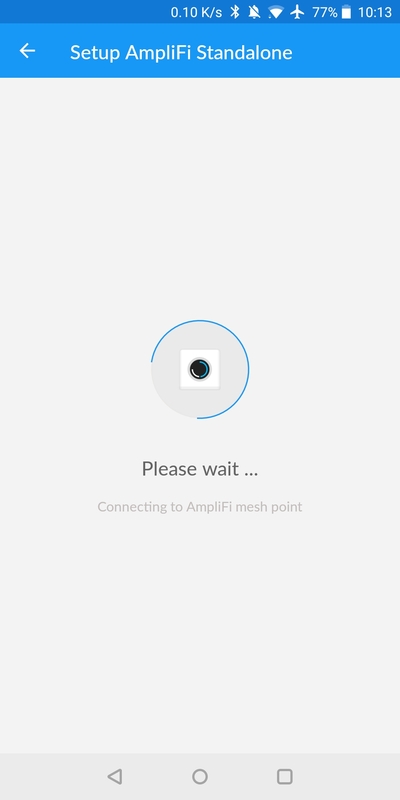 Unfortunately, this is where you will first hit the bug in the AmpliFi app: for some reason, after finishing setup, it will try and try to connect to your network and see your mesh point, but it won't. I forced a reconnect a few times to no avail. 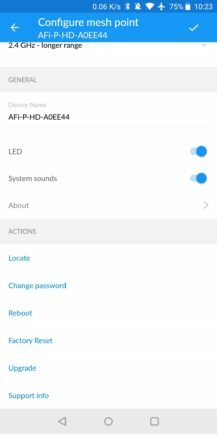 Then, after looking at the mesh point and seeing it was lighting up 5 solid blue LEDs which indicate it was working, I grew a little dubious of the app, so I opened the side menu, tapped on Switch AmpliFi and chose I already have configured AmpliFi. 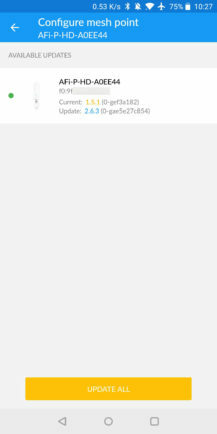 And there you have it, it showed up in the app and everything was fine. If you see this screen, it's likely a bug. After the initial setup, I discovered that my AMPHD needed a firmware update so I started that process. 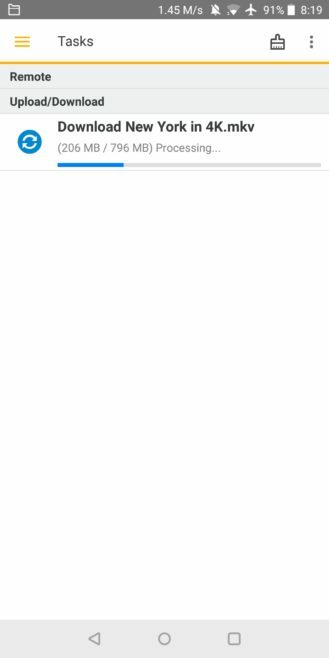 It too was easy: a minute or two and everything was ready, except that once again, the app threw the "Unable to locate device" page at me. This time, I knew what to do and instantly went back to the menu and connected manually. Honestly this is exasperating. 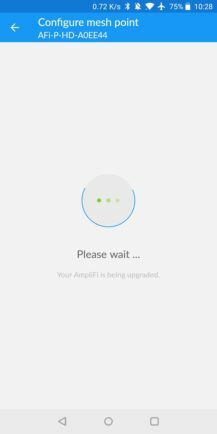 This bug has been there for months and months in the AmpliFi app, and the team should have fixed it by now. 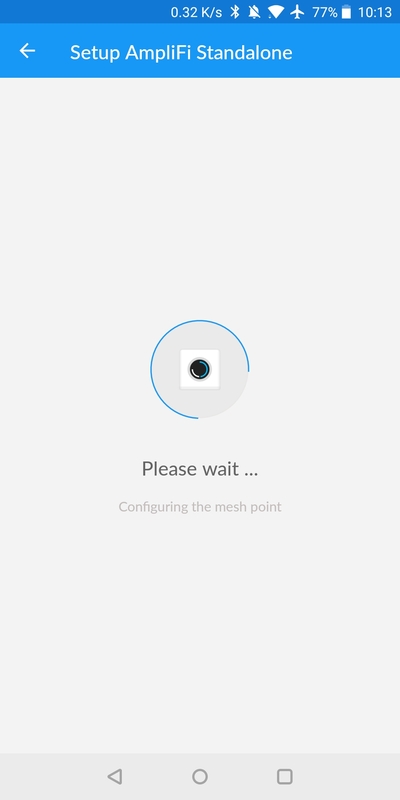 I'm sure there are users wondering why their mesh points won't work and the answer is they're working just fine, it's just the app that's having trouble transitioning from the setup state to the connected state. 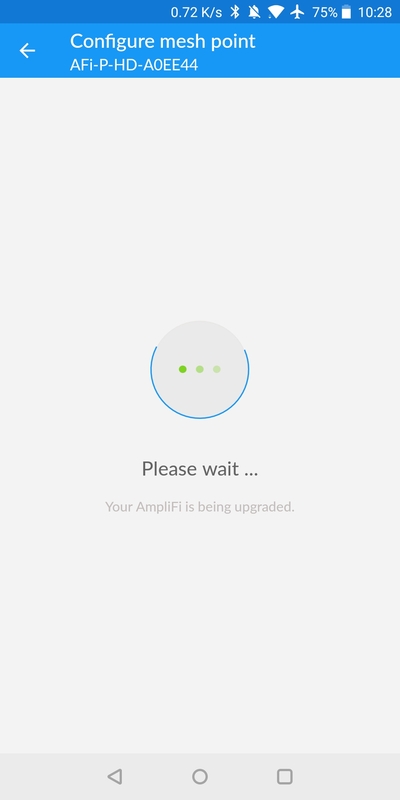 Aside from this annoying bug, the AmpliFi app is quite straightforward and easy to use. 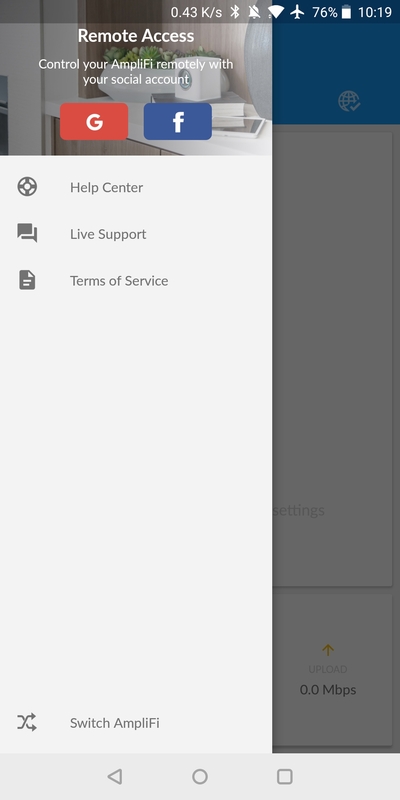 The side menu lets you switch between multiple mesh points or connect new ones, plus it has an account set up menu if you want to control your system remotely. 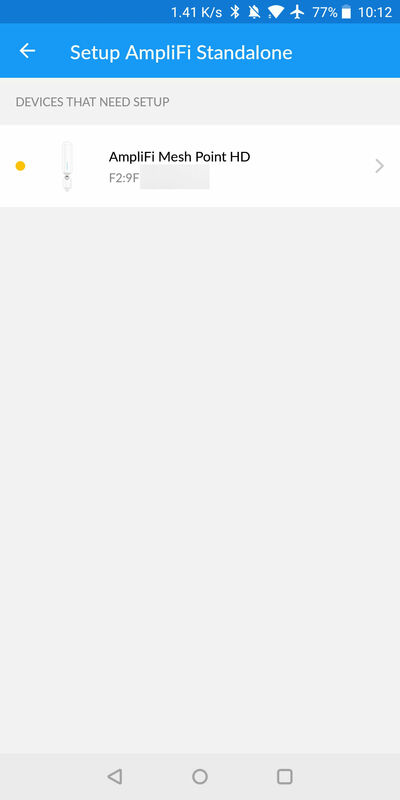 I never felt the need to do that, since I'm only using the mesh points and I just check on them locally, but I like that at least you don't have to create a new username and password: you can log in with Google (or Facebook). When switching between two mesh points, you can see their uptime and MAC address (we have frequent electricity cuts, so 6hrs of uptime is kind of customary here). Tapping on one opens the different app elements to control it. 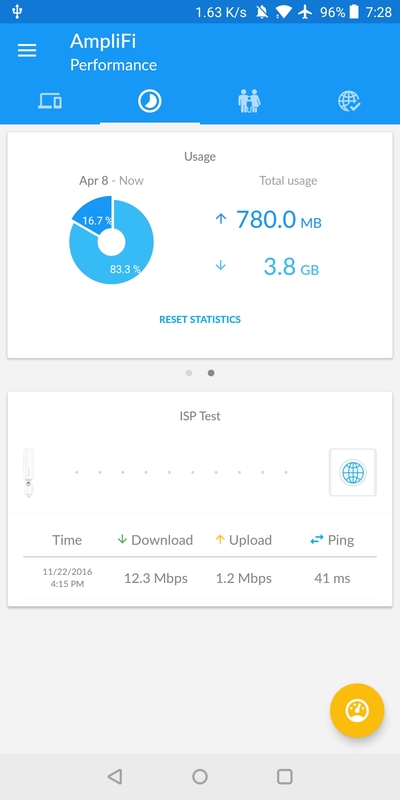 The main Overview page has the connectivity signal, number of clients, plus download and upload speeds. 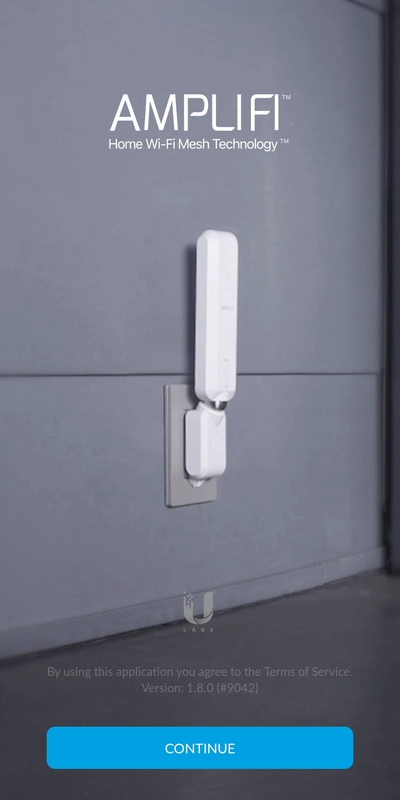 For each mesh point, you can see the signal quality, change its name, turn off the LED lights and sounds, and change its password or upgrade its firmware. 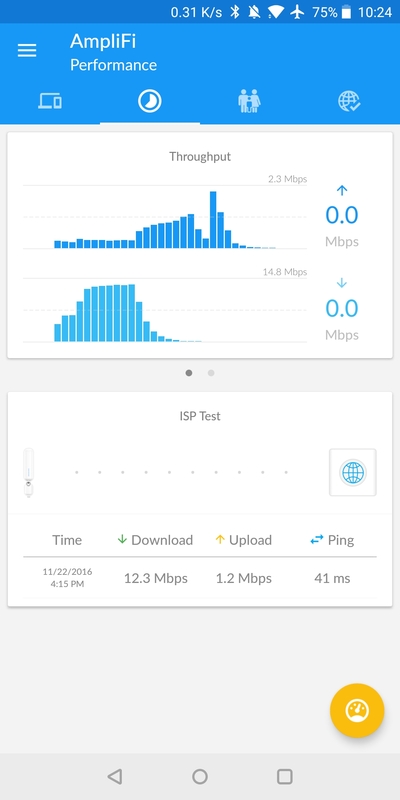 The second tab for Performance shows the recent uplink and downlink throughput plus the total usage pie chart. It also has an ISP test built in, à la Speedtest, where you can check the download and upload speeds and ping, just in case you need to quickly diagnose something on your network. The third tab is for the Family settings. 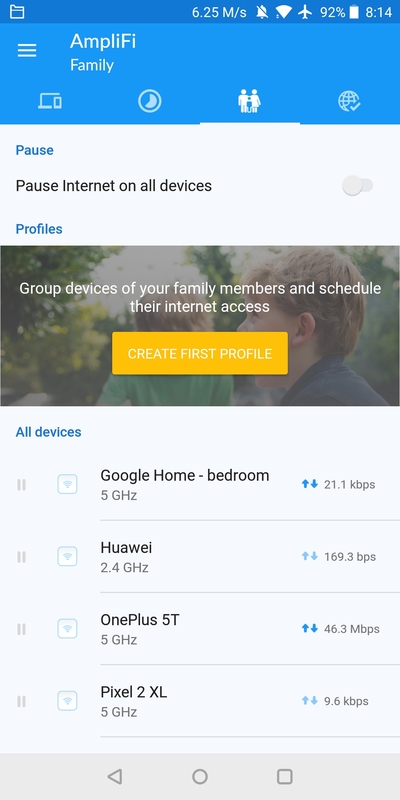 This is where you can pause internet on all devices and create profiles with grouped devices - though none of that worked for me on the mesh point. 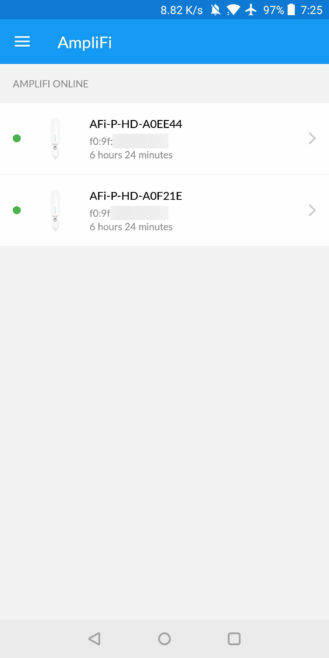 It seems that you'd need the entire AmpliFi HD router system to get these. However, this is also where you will see all connected clients, the band they're on, and the bandwidth they're using. 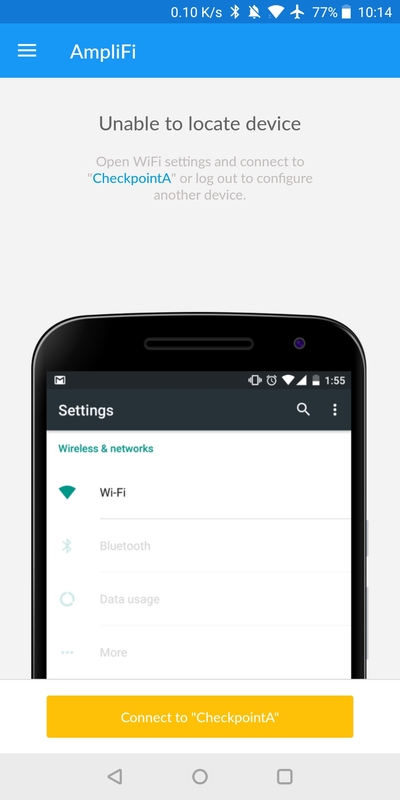 Tapping on any device lets you change its name so you can easily recognize it later and check its details. 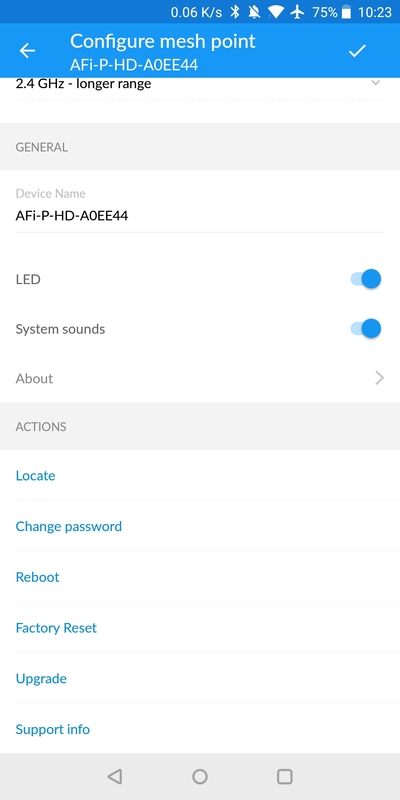 Overall, I found the AmpliFi app to be suitable for its purpose: easy to browse and with some additional information for monitoring connected devices and usage. I would have loved to see a more detailed history chart for usage divided by days and devices, but getting this kind of detail from a mesh point is already good to begin with. 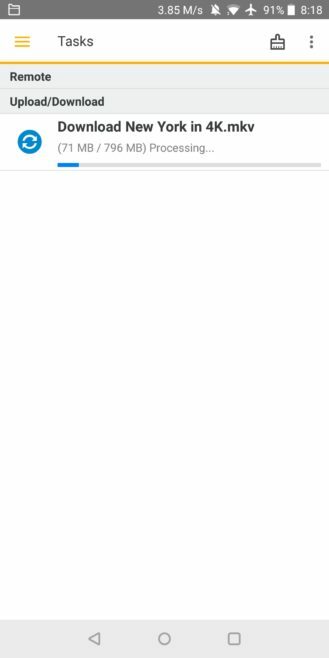 By comparison, my Archer VR2600 router, despite being relatively new, doesn't tell me what level of bandwitch each device is using right now. After the initial setup, I was a little weary of what would happen to my devices. 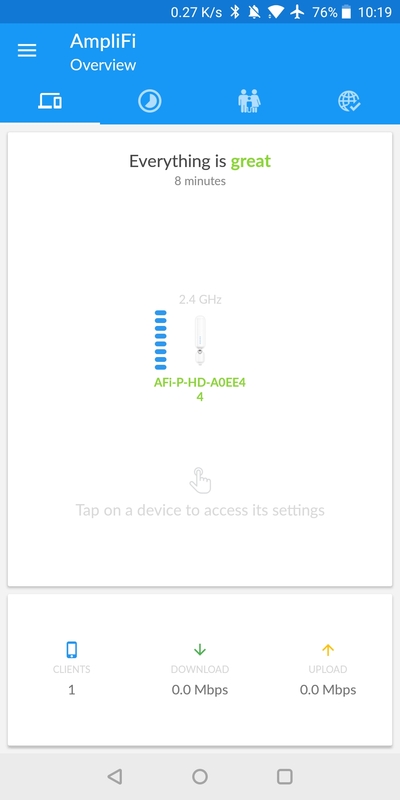 Would they immediately switch to the AmpliFi, would they really see this network as an extension of the existing one and let me continue with local control/streaming, or would I have to reset everything? The answers to those questions in order are: yes, yes, yes, and no. I was impressed. But the main test for the AmpliFi Mesh Point HD was seeing if it could actually improve connectivity in the master bedroom and bathroom. With my regular router, my Pixel 2XL and OnePlus 5T as well as my husband's Nokia 8 have trouble latching onto a connection in the bedroom and staying connected. 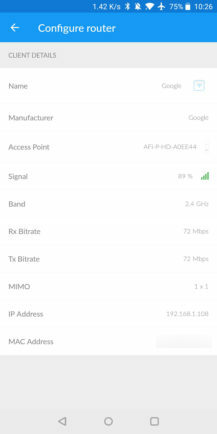 My Galaxy Tab S2 is even worse, often dropping connectivity and requiring a Wi-Fi toggle to force it to look for the signal again. 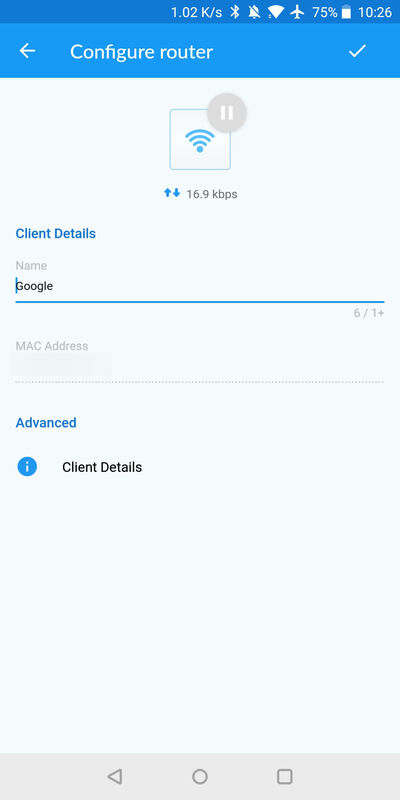 The Google Home speaker we've placed in the bedroom also struggles to stay online and we've run across errors from it way more than the Home that sits near the router. In the bathroom, the situation is much worse. My Tab S2 doesn't get any kind of signal and our phones struggle so much that we often disable Wi-Fi there and let them switch to 4G. With the AMPHD installed in the hallway leading to the bedroom, somewhat midway between it and the router, the situation was immediately better. None of our devices struggle with connectivity neither in the bedroom nor the bathroom anymore. 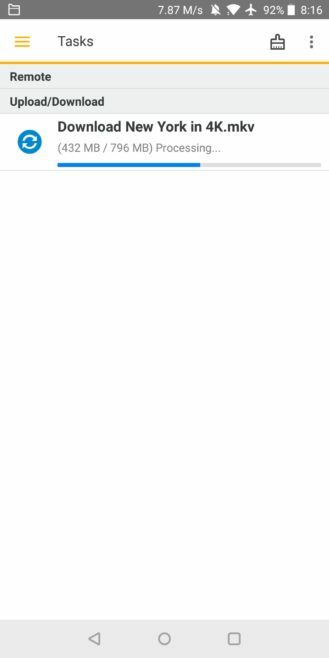 Plus, my Galaxy Tab S2 sees full Wi-Fi bars in the bathroom for the first time since I got it (so I can finally get some quality work done there, heh). The difference is night and day: more reliable connectivity, higher speeds, fewer errors and disconnections. For a quick test, and since my ISP gives me a bit of an unstable connection, I tried downloading a video on my OnePlus 5T from my Synology over the local network (to avoid the ISP variable). 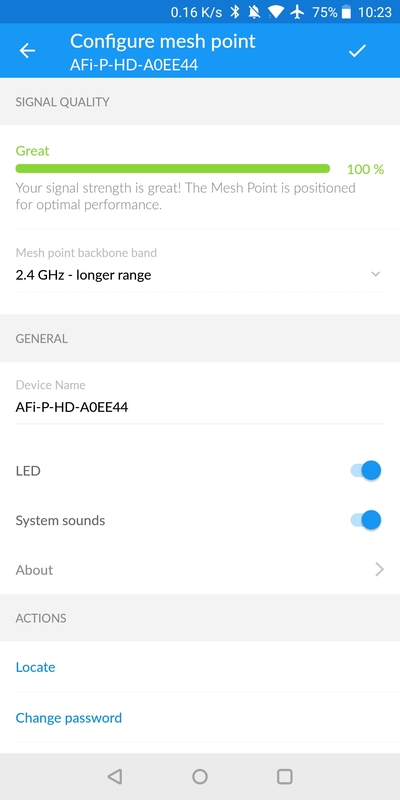 In the bedroom, over several tests, the OnePlus oscillated between 3 and 4 MB/s without the AMPHD installed, but jumped to 7-9 MB/s when I plugged in the mesh point. Look at the speed in the status bar. Left: bedroom, without AMPHD, Right: with it. In the bathroom, the difference was even greater. 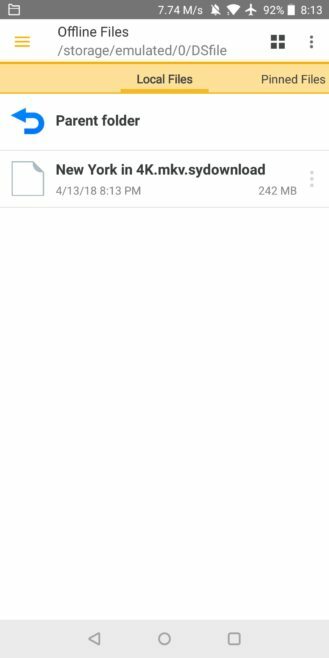 With the mesh point unplugged, when it managed to grab a connection to the router, the OnePlus 5T downloaded at a speed between 1 and 1.5 MB/s. It disconnected frequently too. After plugging the mesh point, there were no disconnections and several test downloads yielded speeds consistently over 7 MB/s. Left: bathroom, without AMPHD. Right: with it. I repeated the tests over a few days with similar results then stopped. At that point, I had already decided I never wanted to unplug the AMPHD ever again. I was sold on it. 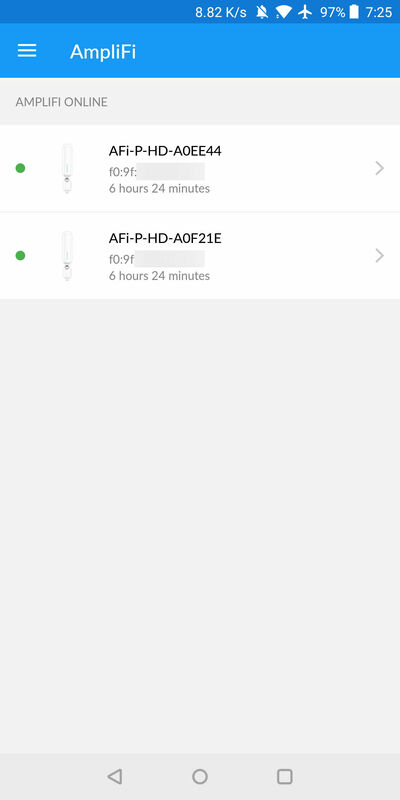 The only issue that I did encounter in that setup was when moving between the side of the house where the router is to the side where the AmpliFi is. 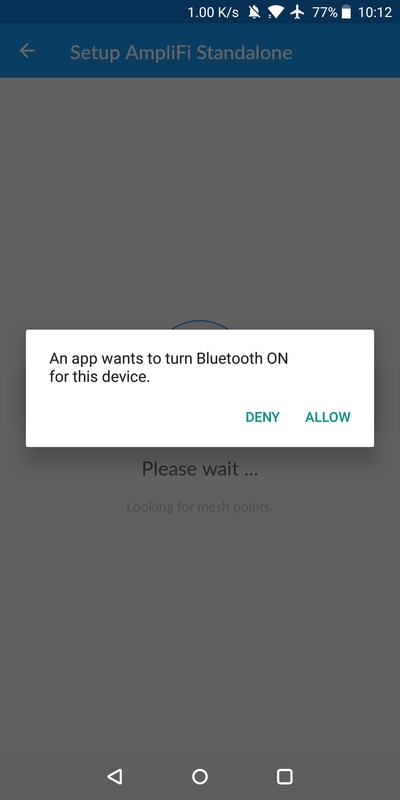 There are a few seconds where things get a little unstable until the device switches to the mesh point, but it's only a little annoyance compared to not being able to connect at all. You may have also seen in the screenshots that I tested two mesh points. I tried installing the second one on the opposite side of the apartment, in the living room. However, it was so close to the main router that things were a little wonky in my tests. I felt that devices were not able to decide which one to connect to and stayed in that halfway state unable to properly commit to one of the sources. Eventually, I unplugged that mesh point. I didn't need it to begin with since signal was pretty stable in the living room without it. So keep this in mind in case you have a small apartment or you think about installing the mesh point close to the main router. 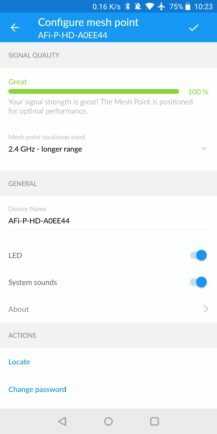 The AmpliFi Mesh Point HD is not for everyone. Many houses and setups could benefit from a complete revamp and switching to a full mesh network system. But in case you're happy with your existing router and need a little push to get the network over to parts of your apartment or in case you're tied to a network provider's router and can't install something new, you may want to look into this mesh point. It provides many of the benefits of a mesh system without any of the hassles of changing your entire setup. Plug it in, take 2 minutes to connect it, and you're good to go. (Well, minus that app bug.) 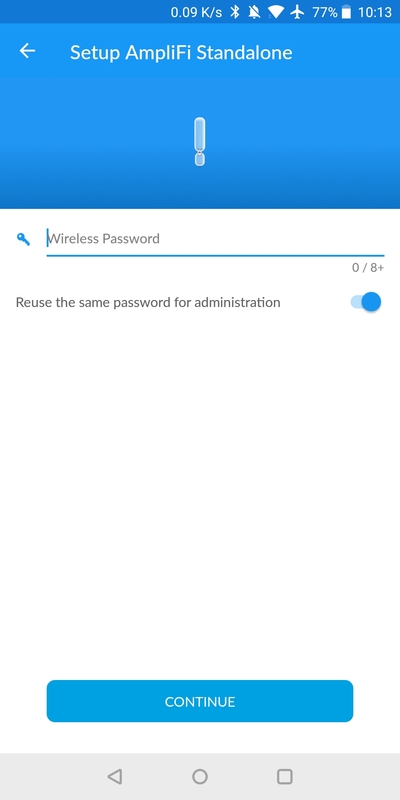 Your phones, computers, tablets, and smart gadgets will switch to it without any question asked and you maintain the local streaming and control that's provided by staying on the same network. 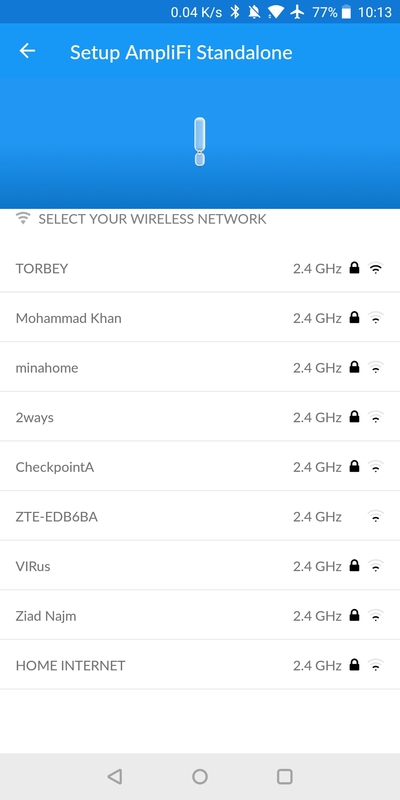 After several weeks with the AmpliFi Mesh Point HD installed in our apartment, it has become sort of invisible. And that's the best compliment I can give it: it does its job, doesn't get in the way, and we never have to think about it.